A cairn erected during the centenary celebrations of Hume & Hovell's explorations. Thursday was a red-letter day in the history of Avenel, the event being the unveiling of the Hume-Hovell memorial. The ceremony was billed to take place at 3.30 o`clock, but it was nearly 5 o'clock before the visiting party, Mr. Gates and Sir J. Barrett, gave addresses on the history of the Hume-Hovell expedition. Mr. J. D. Hambrook, head teacher of Avenel State school, who was the prime mover in the erection of the obelisk, also delivered a speech. The president of the Seymour shire presided. 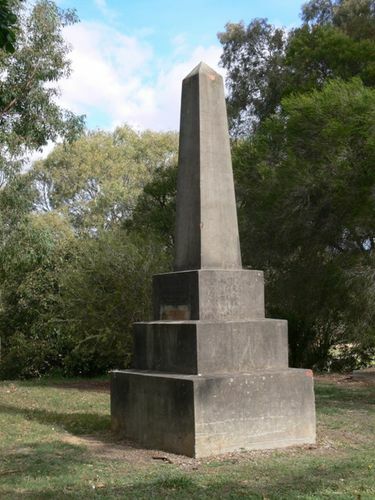 The memorial is built on an imposing eminence on the banks of Hughes Creek, on the main Melbourne-Sydney road, beside the grave of an old pioneer. Age (Melbourne), 22 November 1924.